Contemplating the terrible laxity in the church today, one realizes the urgent need to warn people of the terrors of hell and encourage them to enter into the glories of heaven. 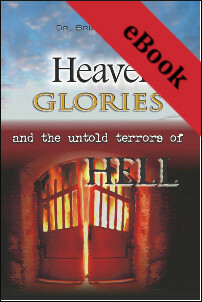 Dr. Bailey was compelled by God to write this book, drawing from his own experiences and the experiences of others that have had of the glories of heaven and the torments of hell. Dr. Bailey clearly presents God-given, heavenly goals, as well as dire warnings of the fires of hell, which so many have fallen into. As you pursue this powerful study, may it cause you to determine to avoid the pitfalls of sin that will only lead to hell and to find and remain on the pathway of holiness that lead to Christ and the glories of heaven.